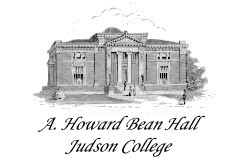 The Alabama Women's Hall of Fame is located in Marion, Alabama, on the campus of Judson College in A. Howard Bean Hall. The Alabama Women's Hall of Fame, which occupies the main floor, was established to provide a permanent place of honor for Alabama's most outstanding women and a place for people to visit and learn about the significant contributions that these women have made to our state and nation. Visitors will have the chance to meet women from the past--some well-known and some who have been overlooked in the history books. Stories of Helen Adams Keller, Julia Strudwick Tutwiler, Amelia Gayle Gorgas, Tallulah Bankhead, Mildred Westervelt Warner and others are told through portraits, photographs, letters, and bronze plaques. The Hall of Fame began in 1970 to honor the lives of outstanding women from the state of Alabama. Inductees must be deceased for two years and be from or affiliated with Alabama. Women to be inducted are selected by unanimous vote of the board of directors of the AWHF. The board is from a cross section of the state and represents broad areas of interest.To nominate a woman for this honor, call (334) 683-5167 or use the printable FORM and mail to AWHF, Judson College, 302 Bibb Street, Marion, AL 36756.